Students looking for another chance at graduating high school along with gaining job and career development skills are being invited to a new “transit” school located within Boys & Girls High School. 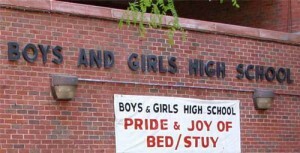 It’s called the Research & Service High School and it targets overaged and undercredited students 16 and over from throughout Brooklyn and Bedford-Stuyvesant that are sometimes deemed at risk. Research & Service High School Principal Allison Farrington said many of the students come from difficult life situations such as teenage pregnancy, or incarceration or have problems with parents. “A lot of these kids become disengaged and tend to drop out, but (Boys & Girls High School Principal) Bernard Gassaway wanted to make sure this is a community school where anyone can come and be educated,” said Farrington. Farrington said besides formal education, the students are also provided with social services, academic counseling and a whole support network that includes career development and secure paid internships through a partnership with the community-based organization FEGS. “All the classrooms are Common Core-driven and we accelerate the classes. Instead of having an eight-period day, we have less periods, but they are longer and more intense,” said Farrington. The school started last year as a pilot program with about 40 students and it has grown to 110 students so far this year with enough space for 180 students – all of whom share common space resources with Boys & Girls such as the library. Farrington called the idea of “transit” schools as only for at-risk kids a misnomer and that “sometimes life just interrupts their academics”. “One student came to us with only eight credits last year and she outperformed everybody in the Regents tests,” Farrington said. Farrington is also a big proponent of the controversial Common Core standards, in which students must focus on literacy in history, science and technical subjects.